MormonInfo.org - False Prophecies - Why didn't the Civil War become a world war as Smith prophesied in D&C 87? LDS often point to D&C 87 as a justification for Joseph Smith getting a prophecy right. But the problems with this are 1) there were news reports available prior to this prophecy that told of the building tensions between the Northern and Southern States, and 2) even if Smith got a prophecy right, Deuteronomy 13:2 said that even false prophets may offer a sign or a wonder which can come to pass. Nonetheless, if they teach other gods (vss. 2-5) or claim in God's name that something is to come about which doesn't (Deut. 18:20-22), then we are able to identify false prophets. The true God doesn't make mistakes, and thus He does not allow His prophets to make mistakes when He speaks through them. Having said that, in 1832, when Smith said that the war "beginning at the rebellion of South Carolina" (D&C 87:1) would become a world war by the Southern States calling on others like Great Britain for help and they in turn calling on others, he made it clear he was false prophet. 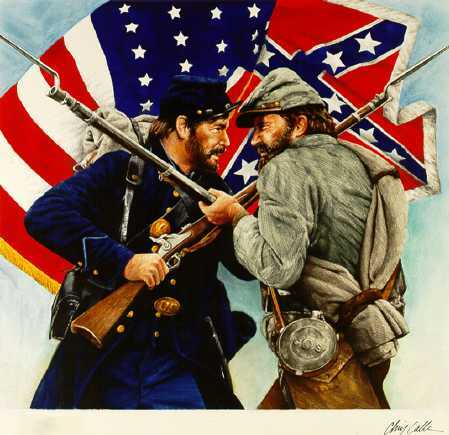 The Civil War was fought exclusively between the Northern and Southern States. In his article The Prophecy on War, Gerald Smith claims the prophecy in D&C 87:1-4 begins with the Civil War, but goes on to speak of our own day. He reads this passage that the Southern States would call on others like Great Britain for help. Then Great Britain and others will later call upon others for help in fighting other wars like WWI and WWII. He then goes on to interpret the "slaves" and "masters" of verse 4 as something other than pertaining to the Civil War era. They actually pertain to the masters and slaves of communism and racism since the two World Wars. There certainly are problems here. It appears the only reason for this interpretation is that the Civil War did not in fact become a world war. Even the D&C chapter description for verses 1-4 says, "War foretold between the Northern States and the Southern States" without mentioning any other future wars. A straightforward reading of these verses would not seem to indicate that there is an extension to other wars not actually involved with the war effort between the Northern and Southern States. Verse 3 clearly says that "the Southern States will call on other nations, even Great Britain, as it is called, and they shall also call upon other nations, in order to defend themselves against other nations; and then war shall be poured out upon all nations." Note: it does not say, "The Southern States will call on other nation states for their defense, and only after the Civil War will other wars generate into a world war." And why only after the Civil War? Why not after the US-Mexican War (1846-1848), the French Revolutionary Wars (1792-1802), or some other war in order to bring about world war? Why must it begin with the Civil War? Recall that it was almost 50 years between the Civil War and WWI. G. Smith arbitrarily lands on the ravages of modern warfare begun in the Civil War that opened the door to mass destruction. But why not arbitrarily choose some other war that involved another apt similarity like having more than simply two sides fighting (e.g., the Hungarian Revolution of 1848-1849)? All world wars fought to date--including the Cold War and the War on Terrorism--were not specifically the result of the Civil War, or of any other particular war; they were the result of the whole history of warfare. The final problem comes in verse 4. G. Smith simply allegorizes the "slaves" and "masters" to make these terms apply to something other than the war of 1860-1865 where they are germane. For more on this whole issue, see here.